Who doesn't love miniatures? Seriously. But they're not always the most affordable accessory to buy, they take up a lot of space, you often have to paint them (though I gather some folks really like doing this), and so on and so forth. Counters can be pretty good, but Arcknight seem to have split the difference and made Flat Plastic Miniatures, which is a pretty clever solution. 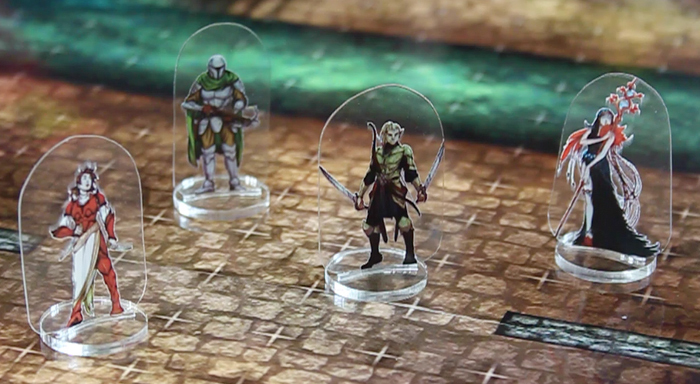 Each miniature is a clear sheet of plastic with a full-color illustration on it, and it sits in a clear plastic base. There's a huge variety of miniatures, and the artwork is beautiful. Not only that, but for $75 you can get somewhere in the neighborhood of 300 unique minis, which is a pretty amazing bargain!